Meet Our New Deputy Gal! A big welcome to our new Deputy State Archivist, Kathy Marquis! Most recently a librarian, but definitely an archivist at heart, we thought you might like to get to meet her. If you visit the Archives, be sure to say hi! So, here I am in my second month as Deputy State Archivist. 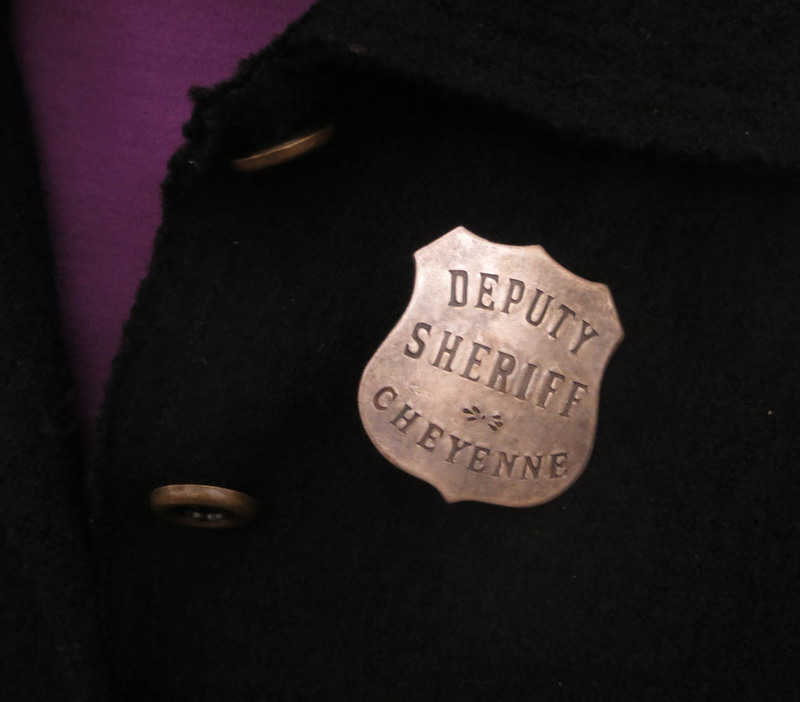 It’s great to be a deputy in the wild west! So far, I’m spending time getting to know staff, doing all the online trainings that come with new jobs (the winter driving module should prove to be useful right away, since I’m commuting from Laramie at the moment…) and reading up on all the accomplishments and challenges of my new workplace. How did I come to be here? My interest in archives goes back to my undergraduate days at the University of Michigan. My women’s history professor brought us to the manuscript repository on campus (the Bentley Historical Library) and the reference archivist gave us an introduction. And that was all it took to convince me that I wanted her job when I grew up. I served as a “page” (a student who retrieved boxes from the restricted stack area) for two years in college and loved every minute. I went on to Simmons College library school in Boston which had an archives program (not too many in those days!) but I was already employed at what seemed like my dream job: manuscripts processor at the Schlesinger Library on the History of Women in America, at Radcliffe College. I organized and described the papers of women and families. Most were from the East Coast, but I was lucky enough to process a part of the papers of Jeannette Rankin, Montanan, suffragist, pacifist, and the first female member of the U.S. Congress. I got to do some reference occasionally, but mainly it was my opportunity to start digging into some of the most fascinating collections in the country. Lucky me! After I finished my MLS, I became the reference archivist at the MIT Institute Archives and Special Collections. Such a different set of modern records, but a great learning experience. It was a very quick learning curve on the records of science and technology (not my background!) and it was wonderful to learn about these topics while providing access to some of the key players in twentieth century science and engineering. From Cambridge, I went to the Minnesota Historical Society in St. Paul. Despite the quaint sounding name, MHS employs over 300 staff, runs the state library, archives, manuscript repository, has a press, runs all the state historic sites, and has an education program which served (at the time) nearly 25,000 school kids a year. It was a busy place! I used to tell people that my reference interview sometimes consisted of yelling, “Next!” I learned a ton about assisting patrons with genealogical searches, and also about working with government records. In 1999 I went back to the Bentley Historical Library, but this time to finally “be” my early mentor, the head of the reference department. I loved working with the grad students in Michigan’s School of Information, and with my colleagues there – some of whom had been there when I was a student, too. Then in 2002, my husband was offered the job of Director of the American Heritage Center at the University of Wyoming, so we moved to Laramie. I was very fortunate to find a job as Adult Services Librarian at the Albany County Public Library and so began my 13 year career as a public librarian. I really enjoyed being able to assist the public in such important ways, from guiding them in how to use a mouse to organizing book discussion groups to selecting popular reading materials for the first time. Public libraries are anything but quiet places these days. Sometimes I miss seeing a toddler gazing into my office or hearing “Rock Band” throughout the library from our teen programs. 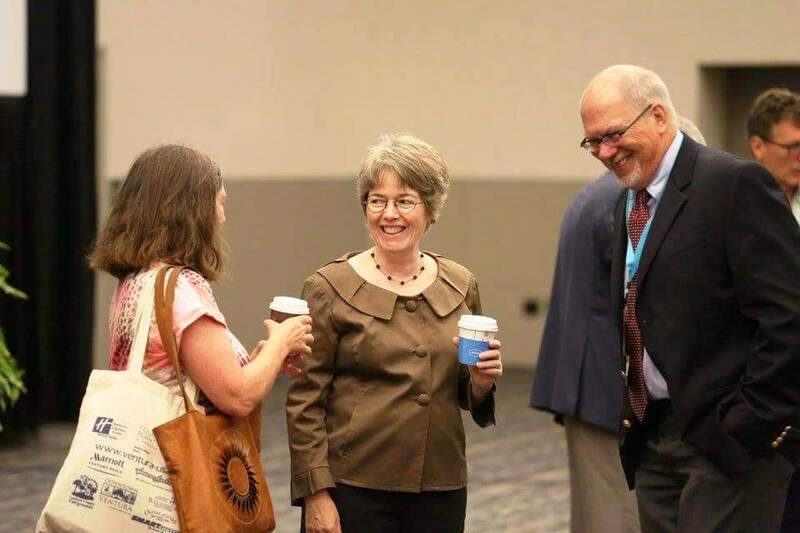 Kathy celebrates at the Society of American Archivists (SAA) meeting with colleague Jackie Dooley (and her caffine boost) and SAA president Denis Meissner. When I left my job at ACPL I was open to staying in libraries, but was delighted when this job at the State Archives opened up. I am happy to be back with archival collections, my first love. Mike Strom, the State Archivist, has laid out a range of challenges at the Archives for me to begin to investigate and work on with him. My first task is to learn our records management system and think about ways to make it easier for state agencies (including all the county libraries and university) to implement this system in their offices. The Archives overhauled our records retention schedules several years ago; we now have less than one tenth the number of schedules for offices to use which simplifies life considerably. But simpler is not better until everyone is familiar with the system and understands how it applies to them. Arranging for long term preservation of Wyoming newspapers is another project we are working on, as is evaluation of the best way to preserve and make available our scanned images and documents. And, we are working on upgrading the way we communicate online to state agencies and the general public, particularly via our website. I am excited to be here, to be learning about all the State Archives has to offer, and to be part of enhancing access to our collections and services. I have so much to learn about our collections and how to answer questions from the public. But the staff here has been really welcoming and they give me “pop quizzes” on how to find things, so I’m learning the ins and outs. I look forward to meeting our researchers and helping them to discover all the amazing information here – both in person and virtually via all the records we are digitizing and making available over the Internet.